When Obsessive Skinner enters the battlefield, put a +1/+1 counter on target creature. Delirium — At the beginning of each opponent's upkeep, if there are four or more cards types among card in your graveyard, put a +1/+1 counter on target creature. Some updates to try to help balance the deck/keep it under $100, and to free up a couple cards for other decks. 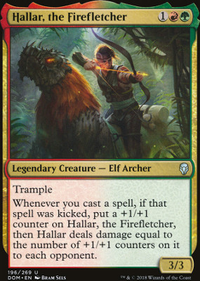 Since you have the shocklands, wouldn't Wood Elves work better than Quirion Trailblazer? Its cheaper, you could fetch Breeding Pool and Stomping Ground as well as have the land come in untapped [to be fair, even without shocks, they're better]. Obsessive Skinner could help ramp up the counters on Animar and Elgaud Shieldmate is some creature based hexproof for him [her, it?]. Fauna Shaman to search up the right creature at the right time and Eternal Witness for some important recycling. This is the kind of toolbox-y deck that I enjoy making/playing so I might have to go find a copy of Animar and build myself a Temur deck. xaarvaxus Thanks for the feedback! I know what I'm asking for is a bit restricting, but like you said, it's a fun way to see what I can do just using what I have. I took out Call of the Conclave for Hive Stirrings (which is good because I have a friend in my playgroup who plays Slivers- now maybe I can beat him at his own game. I took out Star Compass for Obsessive Skinner. I took out Adamant Will for Rootborn Defenses, now that I realize losing +2/+2 for a turn and an extra mana are totally worth a new token and full board protection. Finally, I removed Hunter's Prowess because bumping my whole team is a lot better than just bumping Shanna. Call of the Conclave only makes one token and you don't have a ton of populate effects to crank out 3/3's so I think you'd be better off using something in your maybeboard that makes multiple tokens, ie: Hive Stirrings. I know I'd try to find space for Obsessive Skinner as you shouldn't have a problem getting delirium and getting some tokens above the 1/1 or 2/2 range would be nice. You have a pretty cheap CMC deck so you could probably cut Star Compass. Rootborn Defenses seems to fit in well as a defensive card that incidentally makes a token. Maybe cut one of the auras or giant growth style cards. Overwhelming Stampede seems like it should be an auto-include here, probably in place of one of the giant growth type cards. Its kind of constraining to only have the maybeboard to work from as most of the suggestions I'd normally make aren't on there [such as March of the Multitudes, etc] but it is an interesting exercise on how creative you can be from a limited cardpool. To start off: Hardened Scales, Bear Umbra and Ordeal of Nylea. You do allot with just one counter, make use of it! And bear umbra or ordeal of nylea not only means counters but also a free extra Jenara abilities each turn. Then we have allot of +1/+1 synergy in this deck, but allot of them are single use or difficult to get. Ninth Bridge Patrol is by no means terrible, but we don't have token generators let alone sacrifice outlets, so what about Cathars' Crusade? We want to grow, not compensate when we shrink! Hunt the Weak, forget the counter and go for Nature's Way. Same concept but cheaper and more diverse. Because what about Collective Effort for multiple purposes. Orzhov Advokist to play it politically. Hadana's Climb, Dragonscale General, Master Biomancer, Tuskguard CaptainVerdurous Gearhulk, Increasing Savagery and ow Kalonian Hydra! And lastly, maybe do with some alternative beaters. Managorger Hydra, Primordial Hydra, Selfless Squire or even Chasm Skulker are great at this. So I’m going to try and give some advice since you’ve been gone 12 years (I think that what you said I your forum post). Modern is pretty fast. By turn 4/5 you should have your decks plan in fully motion. Aggro decks want you dead by about then. 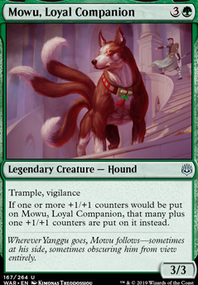 Midrange decks want to have their strong dudes out and you to have little resources. Control wants to have a lock on the board. Whatever you want to do you need to be able to get to turn 4 alive and with your deck doing what it needs to do. As of right now your deck doesn’t do enough at that point. So I’d suggest one of three options. 1) ramp. Get the mana you need earlier so that you can start dropping your threats sooner. 2) Control. Removal and counter spells to slow your opponent down to your speed. 3) innovate. Restructure your deck around another idea that can impact the game sooner. Examples being to focus on cheap creatures with +1/+1 counters and use root kin and a few other grafters with abilities as your top end instead of the base. 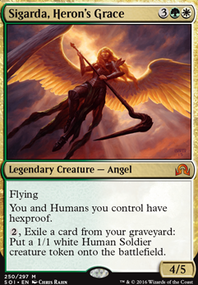 You also need o be aware that removal is extremely prominent in modern. You can’t have too many creatures that rely on others to be good. Graft decks are hard in modern for that exact reason. Path to Exile, Fatal Push and Lightning Bolt are the most popular 1 drop removal spells and there’s almost a dozen options at 2 cmc. Always expect every color to be packing enough removal to take out several of your creatures. For option 1 you’ll want things like Elvish Mystic or Sakura-Tribe Elder to get more mana to drop creatures. Gyre Sage might also help you with your graft base. For option 2. Remand, Mana Leak, and Delay are good choices to start for counter spells. I’m not well versed in blue green removal but you’ll want to look into that as well. The idea is that you don’t need to stop them forever. Just long enough to resolve your threats and kill them. And for 3. Avatar of the Resolute, Obsessive Skinner might be an option, Song of Freyalise, Zameck Guildmage. All options for ways to reduce the cost of your deck and I literally just searched for “creatures counters” and restricted to your colors. You’d easily be able to find better options yourself once you have a better idea of what exactly you’d want to do. One card that definitely should be added since the release of Rivals of Ixalan is Path of Discovery. 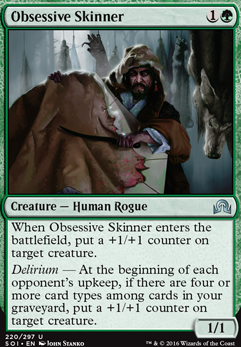 A few other cheap card suggestions are Obsessive Skinner, Loxodon Warhammer, and Unspeakable Symbol. My Skullbriar deck is valued at twice your budget, but feel free to take a look at the theme and mechanics, and for card inspiration.